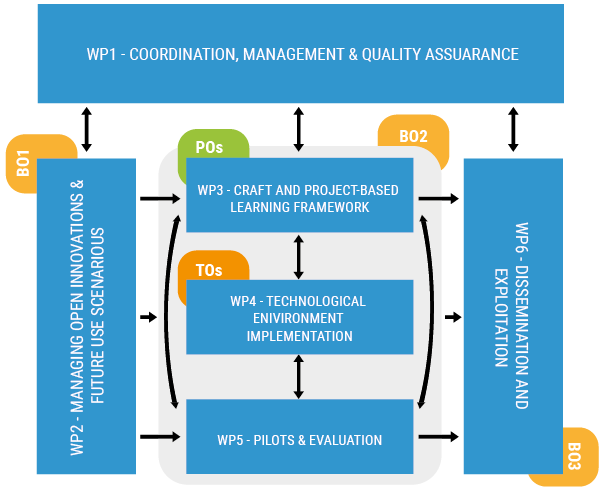 WP1 – Coordination management & quality assurance, WP2 – Managing open innovations & future use scenarios, WP3 – Craft and Project-based learning framework, WP4 – Technological environment implementation, WP5 – Pilots & evaulation, WP6 – Dissemination and exploitation. Each working package is interconnected in structural way as it shown on the right sided graph. Detailed structure of working packages with corresponded steps are visible in the bottom list table.